About a year ago I had never made oatmeal cookies before. I had nothing against them per se, and would always eat them when available (as long as they were homemade), but never really had the urge to make a batch of my own. 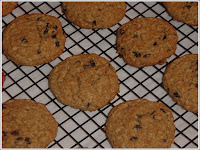 One night I had a craving for some oatmeal cookies so I went to the Food Network website and searched. I ended up slightly modifying a recipe that was sent in to Emeril called "Twisted Oatmeal Raisin Cookies" which turned out to be a great choice. I've probably made these cookies at least 6 or 7 times since then, and they always turn out excellent. The original recipe called for 1 cup of raisins, which I replaced with 3/4 cup of currants. The currants give the same taste to the cookies as raisins would, without having big chunks of fruit in the cookie (which I personally never liked about oatmeal raisin cookies). A few other changes I made include substituting 1 cup of whole wheat flour for 1 cup of white flour (sneaking in a little whole grain is never a bad thing), cane sugar instead of white sugar, and making the cookies as rounds instead of long "snakes" as the original recipe suggests. 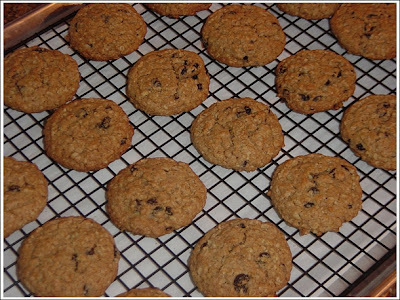 The whole wheat flour does make the cookies a tad bit heavier and drier, but it's hardly a noticeable difference. You could probably cook them a minute or two less to compensate for this. Start by preheating the oven to 350 degrees. Cream the butter with the sugar, then add the egg and mix well, incorporating all the ingredients. To the butter mixture, add the flour, salt, cinnamon, baking soda, and oatmeal. Mix by hand with a wooden spoon until the ingredients are well combined. The dough will be extremely stiff and is kind of hard to mix, this is okay. Add the hot water, currants, and vanilla and once again stir to combine all the ingredients completely. Scoop the dough onto a cookie sheet covered with parchment paper. I use a number 30 ice cream scoop (30 scoops per quart) which makes a nice medium-sized cookie (about 2 to 3 inches circumference depending on the cookie type), but you could use a tablespoon or a soup spoon if you don't have a small scoop. Don't use a regular ice cream scoop (unless you want HUGE cookies)! Bake for 15 to 18 minutes until the cookies just begin to noticeably brown (exactly 17 minutes in my oven). Cool the cookies on the pan for 5 minutes, then move to a wire rack. Once they are cool you'll have perfectly chewy oatmeal cookies that have just the right amount of sweetness and raisin flavor from the currants. Store in a covered container and you'll have cookies for a few days.